The Vikings are attacking continuously to your town! 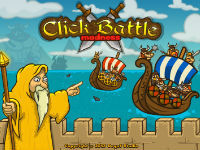 Help the magicians to stop all Viking attacks by only using their magic skills! Match the magicians to cast spells, make use of cannons and eliminate the Vikings as fast as you can! Remember to purchase amazing upgrades to increase your defence or attack power.